We produce for Italy and abroad souvenirs chocolate molds lineaguscio by decosil. 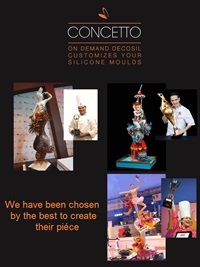 Italian leaders of silicone moulds, we create and sell for over 10 years souvenirs chocolate molds lineaguscio by decosil, food safe silicone moulds worldwide to confectioners, bakeries and Delicatessens. With the decosil molds you can create various chocolate objects in 3D to propose like originals souvenirs at the tourists.